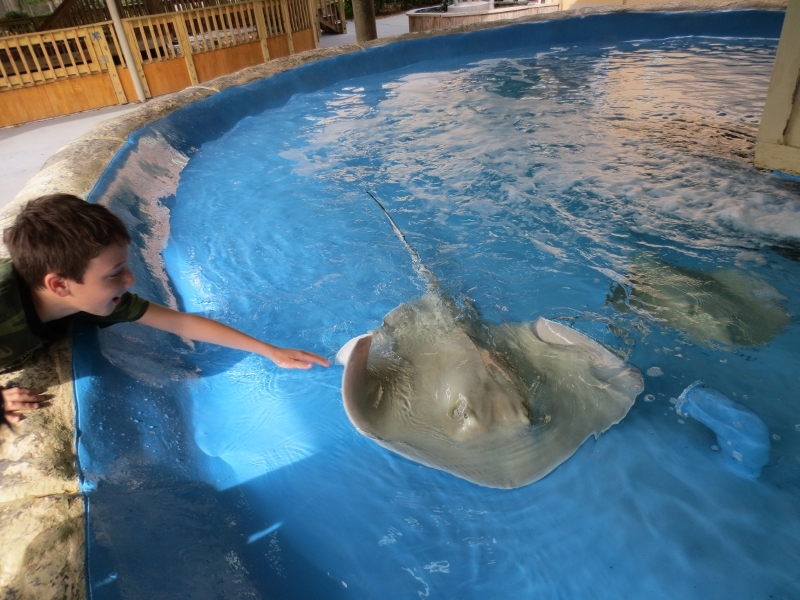 My day at Gulf World Panama City Beach was really interesting and a lot of fun. I always turn into a child again every ti me I go into any sort of animal park, especially marine animals. The layout to Gulf World is very easy to get around and compact. I went there to go Swim with the Dolphins and this program is all it is lived up to be and then some extra are thrown into it to make it a very exciting experience. 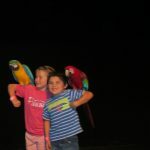 The entertainment of all the animals, the dolphins, the sea lions, the birds, the furry friends, and the reptiles make this a charming Florida Panhandle attraction. 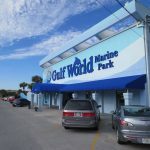 Gulf World is right on Beach Front Road in the heart of Panama City Beach. You cannot miss the complex due to the big sign out front and light blue painted building. Once inside, you will get a map of this 6 acre property to explain in great detail the layout of the grounds. The main entrance is where the gift shop is, and once you have paid the appropriate fees, you will go through the double doors that lead to the park and all that it has to offer. The first things you see are the Alligator, the Shark, and Turtle Tank. 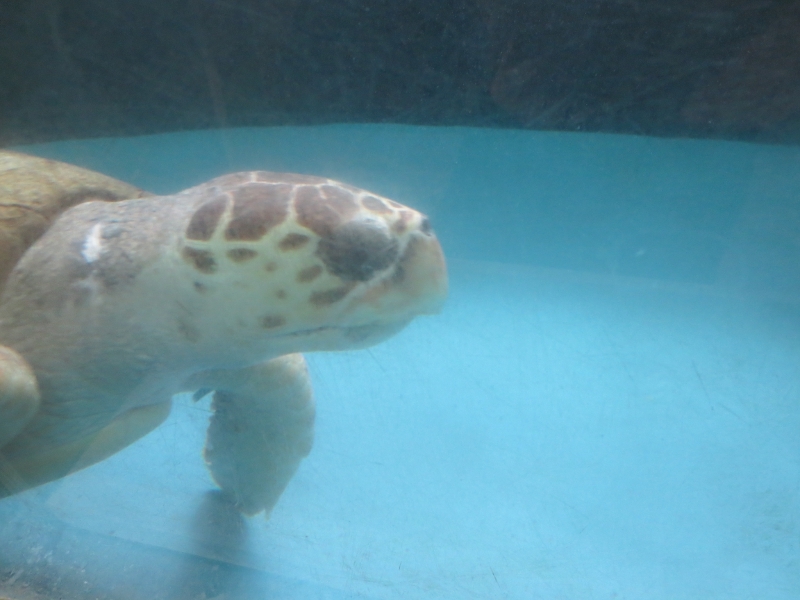 The Sharks and turtles are together and it has a pit area where you get to see them under the water. 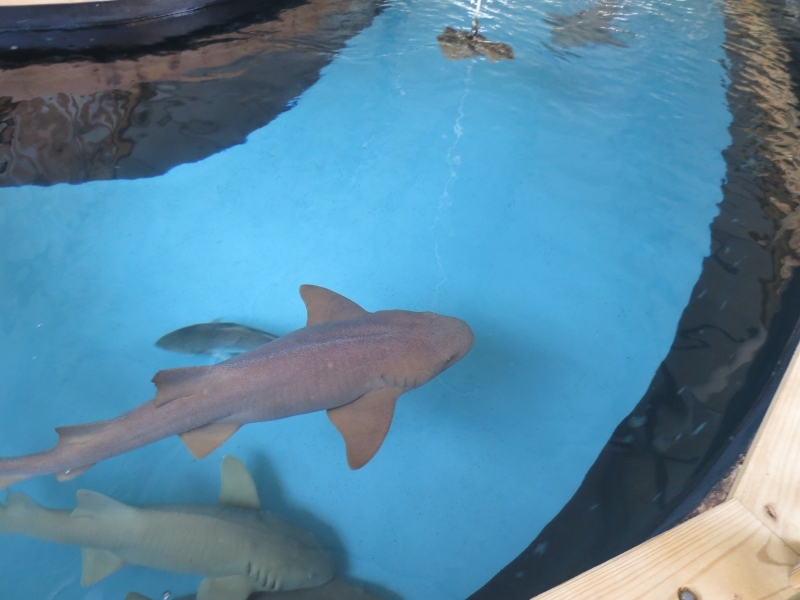 After that, you will move past the sting rays and sea lions and make your way to the Reptile building. The totally enclosed reptile building houses all types of birds, snakes and reptiles. This new addition also has a 600 seat indoor theater for concerts and shows. In the way back of the facility, is the dolphin theater and swim tank area. This area is outdoors and has a huge tank which is built above ground so you can see through many Plexiglas windows and view the dolphins swimming around in their usual graceful and streamline patterns. The first activity I did was the dolphin swim, which is a 20 minute dolphin interaction. Before going into the water, we had an educational briefing from a perky young trainer who informed us all the details about the dolphins and what is going to happen during the our interaction with them. We headed to the changing room where we had the option to put on wet suits or not. Even though the water is heated to 72 degrees, I decided to wear one because it was cool outside. From there, we were allowed to step into the dolphin pool were we got to pet, play, kiss and yes, even the excitement of a dorsal fin ride through the water. Even though I have done this many times, I still smiled from ear to ear all during the program, as you can see by the photos. 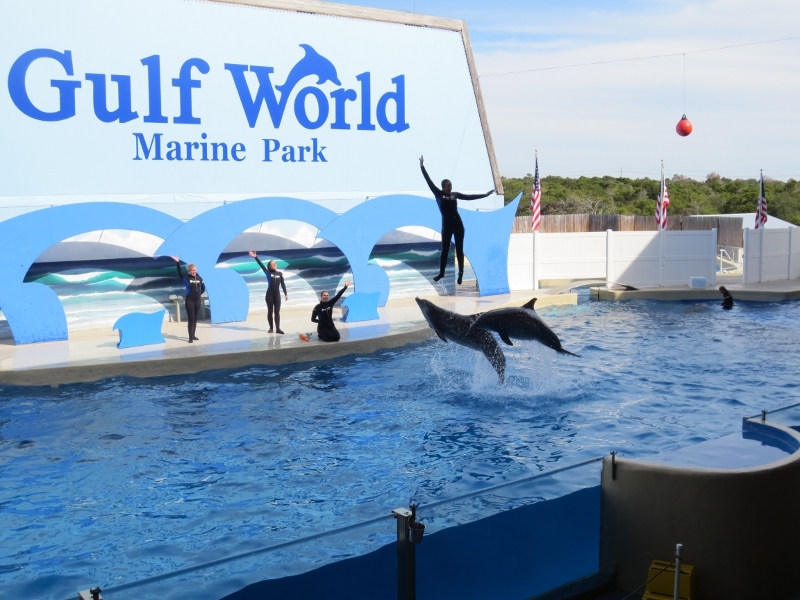 Your general admission entrance is included with the dolphin swim program, which means you get to see all the shows offered at Gulf World. So for the price of $175, I felt this was a fair deal because you get the dolphin swim and the shows. 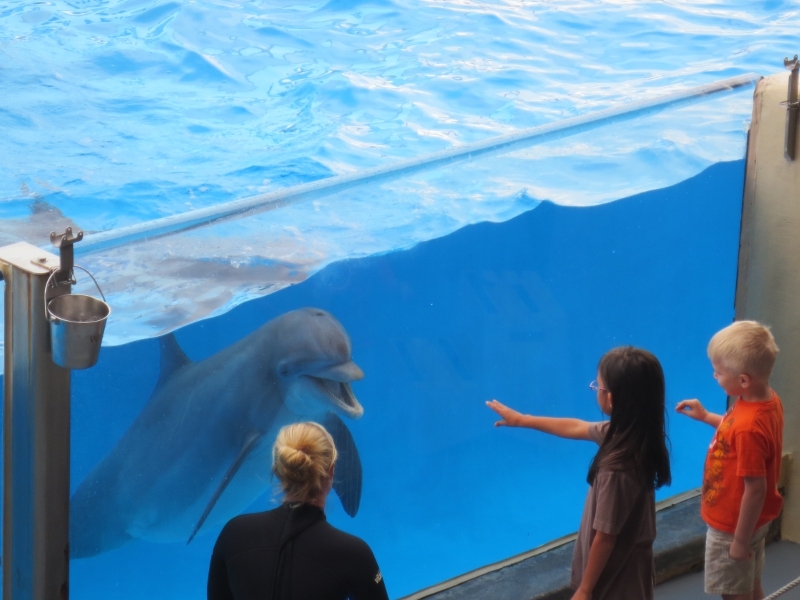 If you wanted to come into the park without the dolphin program, its $28 for an adult and $18 for a child, and 4 and younger are free. My favorite show was the Dolphin Show. 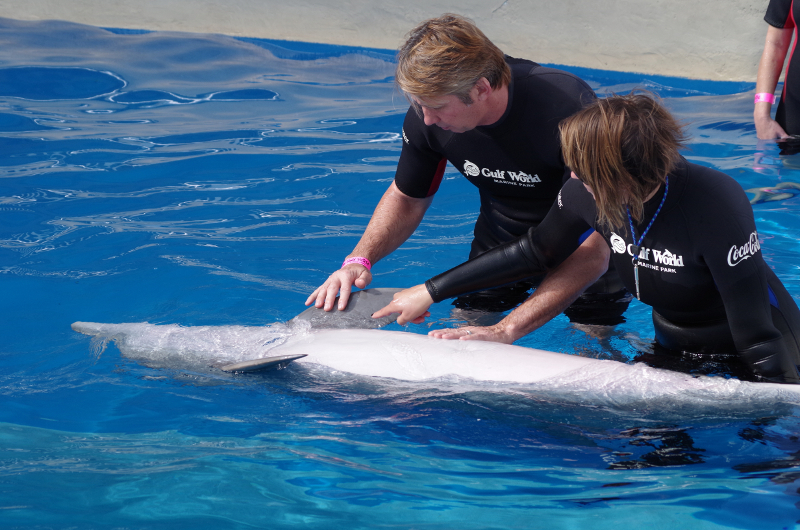 In the same area as the dolphin swim was held, the energetic trainers show us why we all love dolphins so much. The trainers jumped into the water many times to demonstrate to the crowd the power of the dolphins as the trainers get pushed and pulled the through the water. With the upbeat music in the background, the crowd was clapping their hands and cheering as the dolphins preformed with the trainers in tow. This show is 30 minutes long. 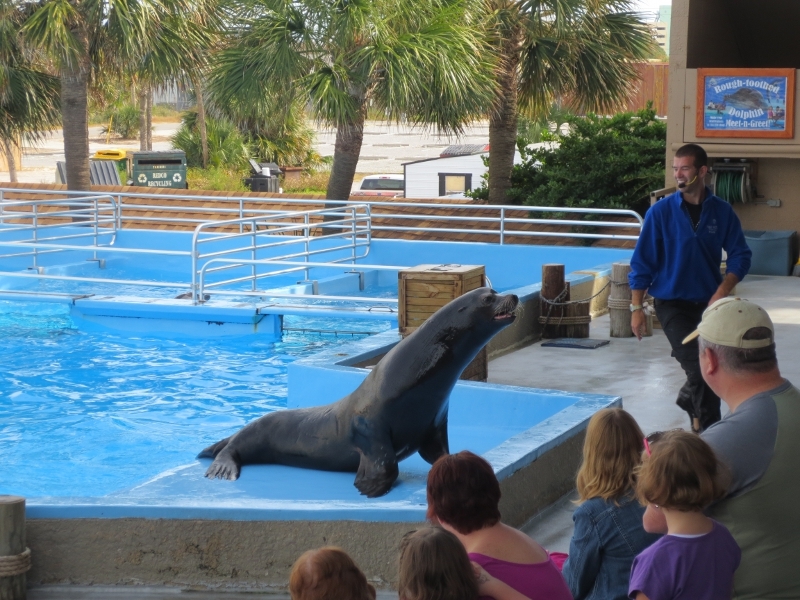 Another marine mammal favorite is the Sea Lion and Rough Tooth Dolphin Show. This 30 minute show is always a crowd pleaser because of the Sea Lions and the Dolphins are together and they put on a show for everyone to remember. I really love sea lions because they have so many human type gestures with their faces, tongue jetting out, a big smile with all their teeth showing, and always barking with funny tones. The rough tooth dolphins are only found in captivity here at Gulf World, they are slightly darker and smaller dolphins as their bottlenose cousins. Gulf World has one show I have not seen anywhere else, the Bird and Furry Friend show. The bird part I have seen at other parks throughout Florida, where tropical birds, fly and do amazing tricks for the audience. But the part I found very fun was the furry friends part, which included normal house cat and dog. This cat sits, lays downs, jumps and follows on command. I never thought they could train a cat but they had one. 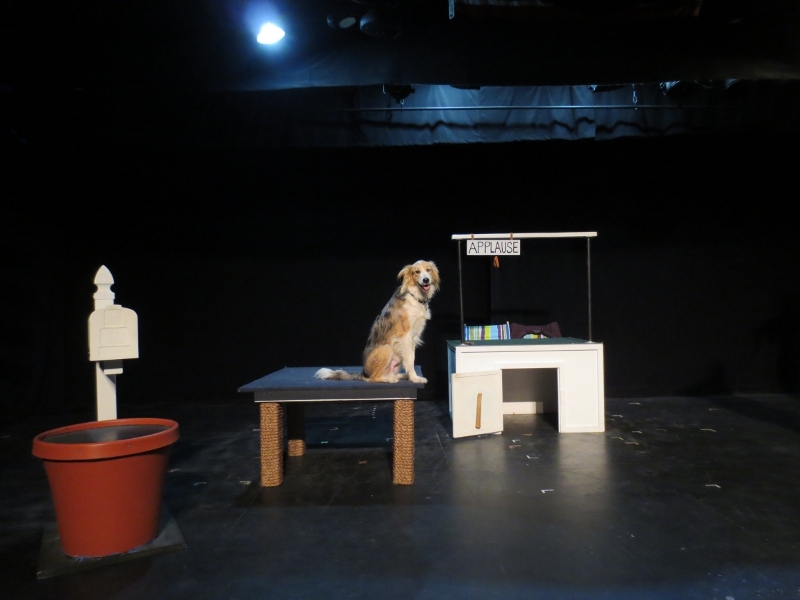 The dog, a border collie mix, did all kinds of trick, my favorite was when the dog took a letter and put into a mail box, close the mail box door, really cute and the children loved it, a big applause. The reptile presentation was my least favorite show, but it can be very interesting if you are a novice to these types of creatures, like Florida Alligator, snakes and lizards. I have seen this type of show many times before but I have to admit the Gulf World presenter made this show fairly funny and entertaining. The one line I like is when the baby Alligator urinated on the floor, he called it “ Gatorade “ , a quick come back to an unplanned event. 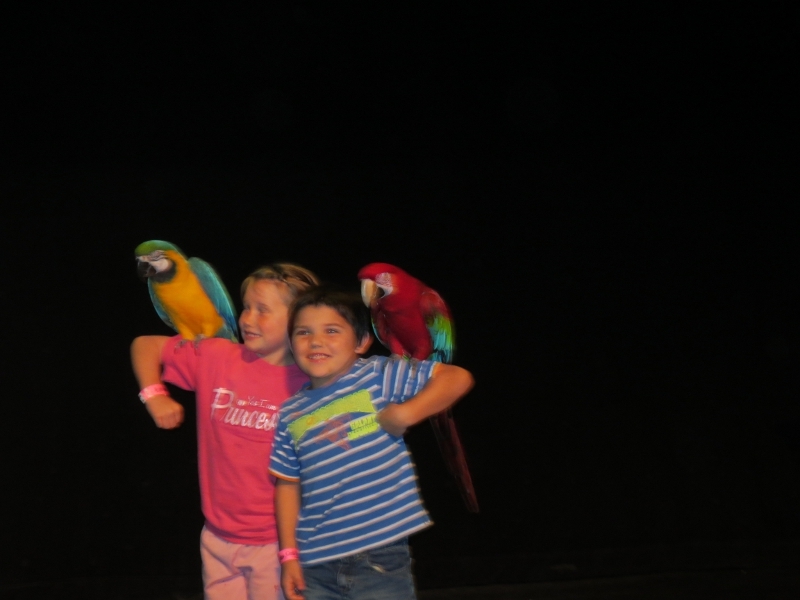 After every show, you are able to take photos with the animals, $10 for one photo, an individual or the whole family. 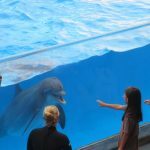 So if you want to have at least some sort of interaction with a dolphin, sea lion, birds, and reptile, you can be assured to have this opportunity. I think this $10 upgrade is a great bargain in this down economy. 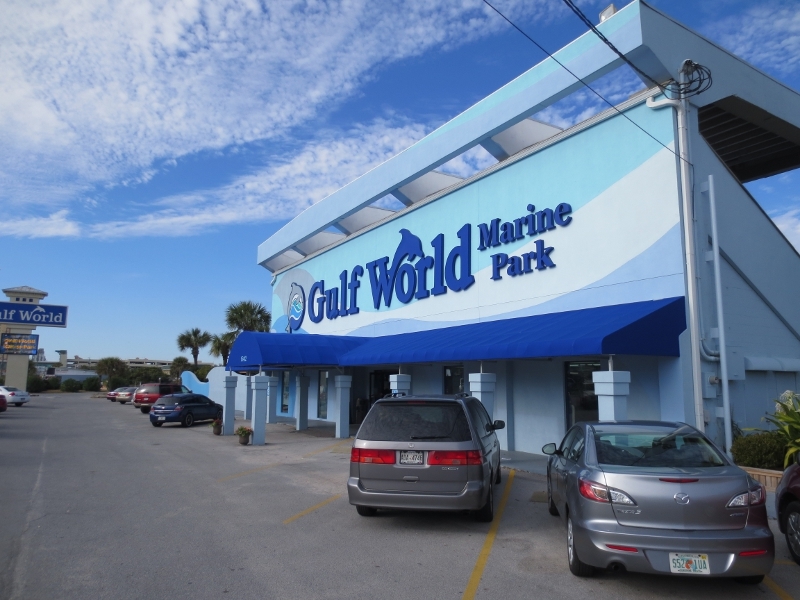 Gulf World has been around since 1969 and has evolved as the community has grown too. 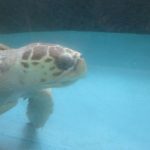 So from a small aquarium to a nice size Marine Park, I would give Gulf World a thumbs up from me if you are traveling to Panama City Beach Florida. 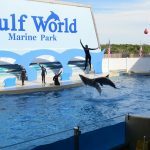 One thing really cool about this area is you can swim with the dolphins in the daytime and then go watch wild dolphins in the Gulf of Mexico in the evening, a real bonus for the dolphin lovers out there. Hopefully the next time I come to the Panhandle, I can bring my family and friends and introduced them to Gulf World too. Furry Friend Show - A lot of Fun!